Artist Edward Chell's installation reflects the Horniman collection’s special renown as a place of inspiration among artists. The combinations of animal remains and exotic artefacts interact with Darwin-inspired hierarchical scientific and anthropological narratives. The bequest of a late nineteenth-century capitalist owner of tea plantations, the architecture, displays and objects appear designed to suggest an unreconstructed account of ‘the ascent of man’, producing for the viewer that uncanny sensation described by Walter Benjamin as ‘the revolutionary energy of the outmoded’. Bloom delicately challenges this theme of ascendancy by foregrounding the work of Anna Atkins, celebrated in the imagery of Chell’s paintings, and in the text of Bloom. Bloom: museum installation view (also reproduced in the in the publication). 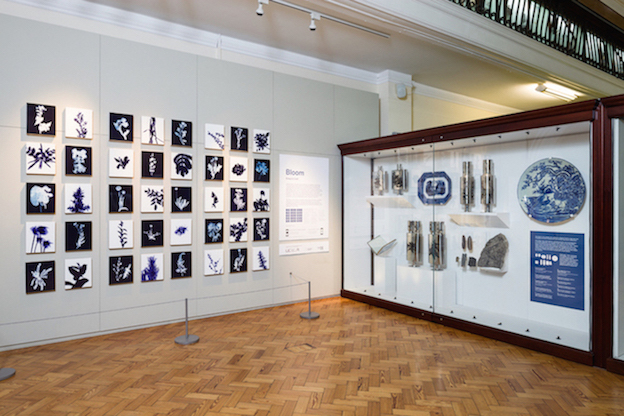 The book represents the original installation, mirroring thematic connections relevant to the Horniman collection: Botany, Ecology, Museology and the passionate impulse to collect. The core collection proposes narratives that disavow the similarities between museums and department stores: their glazed displays, auratic lighting and the registration of exchange values. Historic fixity and scientific merit have been handed down by Horniman not for the purpose of consumption, but to be cared for and learned from. This retro-cultural reserve, of objects from becoming commodities, can then impinge upon the values of the present. Atkins’ fabulous book of botanical cyanotypes provides the impetus for essays relating nineteenth century plant collecting to colonial expansion, the role of botany in allowing women a way into the masculine domain of science, and the collections of souvenirs from ‘exotic’ journeys. Objects now displaced as pathological specimens, trapped as mementoes, ornaments and repositories of family history also comment on national identity, fashion, technology, trade and the taste for discovery that indicates modernity. 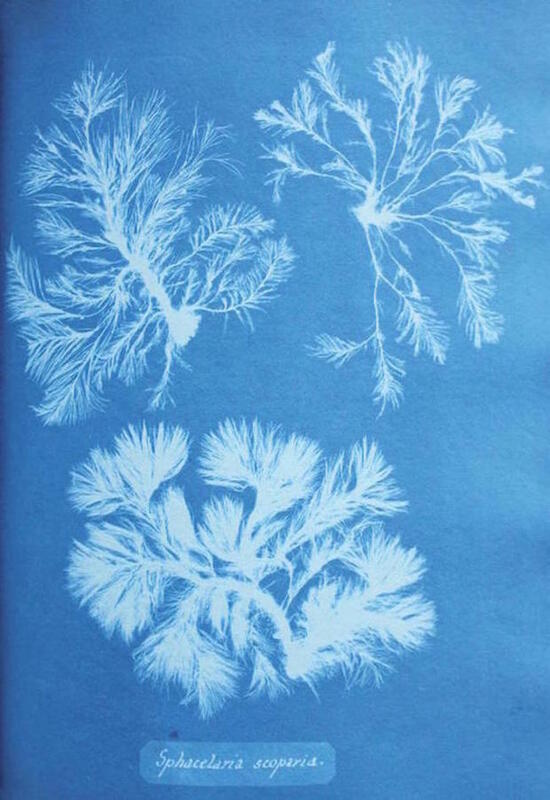 Atkins’ extremely rare book, Photographs of British Algae: Cyanotype Impressions, 1843–1853 (Vol.1), newly re-discovered in the Horniman’s archives, formed the focus of Chell’s own archival practice. 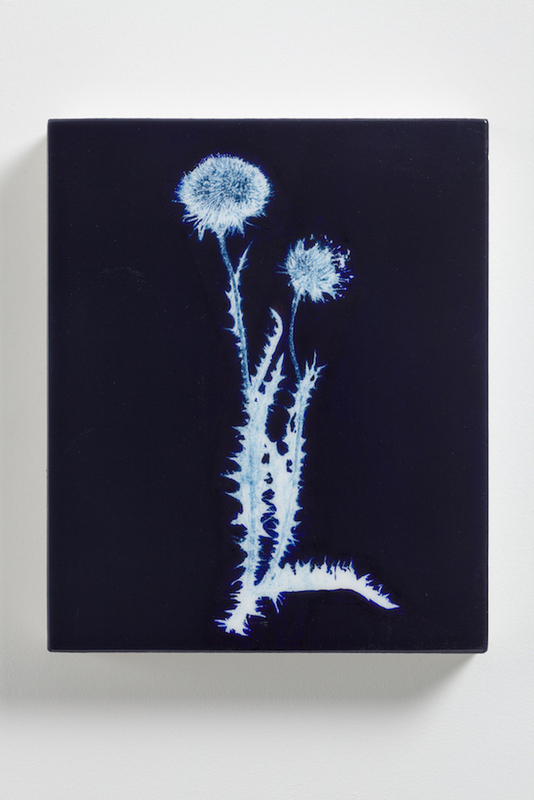 The ravishing blue stained pages of the book were turned daily to reveal Atkins’ images, notable for their patiently repetitive representations of plants as white residual forms, creating a perverse reference to the light of illumination as the unexposed shadow of the plant becomes the focus of evidential interest. This book is the first to be compiled by use of photographic technique, but Atkins’ use of the medium encapsulates the blank ‘here it is’ effect of Roland Barthes’ Lacanian description of ‘studium’, as ‘the Occasion, the Encounter, The Real’. Chell’s paintings, representing botanical specimens in black and white, positive and negative, enter into the spirit of Barthes’ critical questioning of studium. Apart from the title page and dedication to her father, Atkins’ own reserve as an intellectual woman having to know her place in the company of the more distinguished men of her acquaintance is recorded in negative, in her discrete lack of comment, in her intense reflection on the very image that is missing. Anna Ricciardi writes that the images themselves are ‘a series of absences, edges and exposures’, Atkins images are all the more moving because they trace exactly the scale of the original living plant form, as if it had just that moment been removed. The artist as collaborator in scientific research is a recognised contemporary figure, but Chell’s analytical project is political, mining connections through the museum’s history in a contemporary retrospect, as amateur in the best sense, enjoying complex associations and ‘hybridities’ that reveal secretive interactions of wealth and power. Observing diverse examples: decorative motifs, connections with blue dye, drinking tea, trade in cloth and porcelain, simple questions of taste take on correlative down-sides, in poison and industrial morbidity, destructive cultivation and ecological disaster, and the philanthropist Horniman’s own involvement in slavery’s history of repression. This handsomely produced volume is richly illustrated with images of the Horniman collection, the modern botanical gardens, Atkins’ botanic illustrations, related items from other collections and Chell’s own paintings and installation. Bloom’s Joycean title suggests a serendipitous coming together of intense observation marked by time passing. Chell has also focussed on the importance of something overlooked, the connection of Atkins’ blooms and the late nineteenth-century cabinet of curiosities which is the Horniman. Careful consultation with experts at the museum and co-ordination with other contributors have helped reveal the significance of the work of Atkins. Bloom, Emma Brooker, ed, essays by Edward Chell, Anna Ricciardi and Hugh Warwick, Horniman Museum and Gardens, 2015, ISBN 978-1-903338-05-6. Bloom was published to commemorate the installation of paintings and related objects from the collection, created by Edward Chell for the museum, 9 July to 6 December 2015. Joan Key is a painter, writer and independent curator who lives and works in London. She is also a lecturer in the department of Fine Art at the University for the Creative Arts, Canterbury.